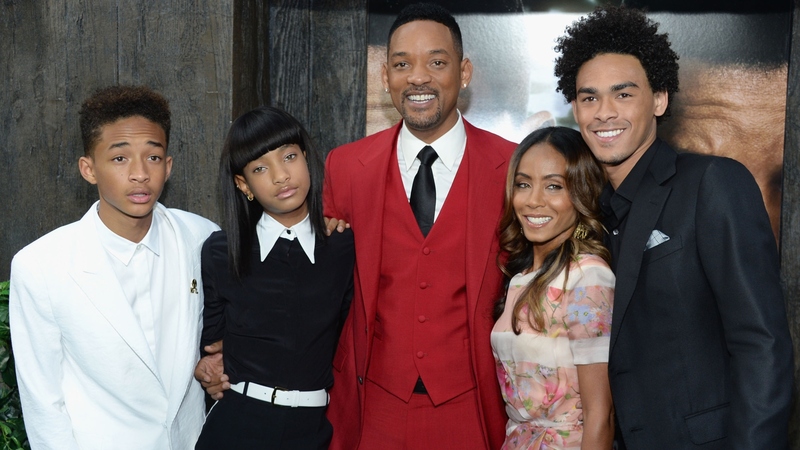 Will then turned his attention to the couple’s kids — Willow, 18, and Jaden, 20 — along with Will’s older son Trey, 26, who was visiting home. When Trey arrives an hour late, Will naturally makes him pick out a themed outfit to put on as well. And, well, we’re starting to see a pattern — especially when Will slips on a bright red and green Santa-face suit with a necklace of blinking, vintage-style Christmas lights. “This feels right for me,” he says, and it’s clear he has something specific planned for the festively dressed family. Don’t be mistaken, though — it isn’t just Will who gets carried away. In case the overabundance of Costco lights wasn’t enough of a hint, we’ll come right out with it: Jada’s a holiday fanatic, too. On Thursday, she shared a video on Twitter showing a dreamy scene of snow falling gently… just outside the Smiths’ California home. “You know you are loving on Xmas a little too hard when you make it snow in LA so that the fam can shoot some Xmas fun for social,” Jada wrote. And on Saturday, she shared a few exclusive previews with Ebony from Monday’s Christmas-themed episode of Red Table Talk. As usual, Jada and Will are out there being goals… and, this time of cheer, spreading Christmas cheer in the process.